With Curve Plotter, maths and science students will find line graphs can be quickly constructed and analysed. It is relatively easy to produce a graph with these apps as well as generating the useful calculations required to find the pattern or relationship between variables. This package consists of two very similar, yet separate apps, designed by the same developer. Curve Fitter can be used to construct a graph based on entering a set of ‘x’ and ‘y’ variable data points. By selecting the specific icon on the screen, a box will appear for the user to add the co-ordinates for the graph to be drawn. This information can be edited easily and returned to if needed. Once the box is closed the graph will automatically be constructed in a linear format as a straight line of best fit. Selecting alternative fitting degrees will further format the graph and the app will indicate the correlation for each degree. Curve Plotter compliments Curve Fitter in layout and style. This version of the app will allow the user to enter an expression or function relating two variables and generate the corresponding line graph. Again by selecting an icon on the screen the ‘expression builder’ box will open for you to edit. The expected range of mathematical operations is offered along with ‘powers’, ‘exponentials’ and ‘trigonometry’. A record is kept of all expressions that have been entered so that previous graphs can quickly be accessed. 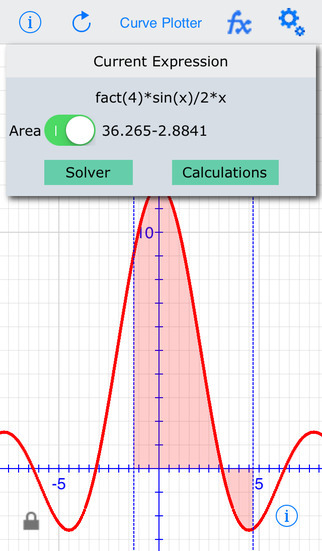 An area calculation between the graph line and the x-axis can be accessed by simply long tapping on the screen. For both apps once the graph has been drawn the options to analyse it are extremely similar. In Curve Fitter and Curve Plotter there is an option to solve for values of ‘x’. This will calculate the corresponding ‘y’ value and the new point can be plotted on the graph. The gradient of the line at any point can be displayed by long tapping the screen. By dragging your finger along the line it will track the co-ordinates to give live calculations. 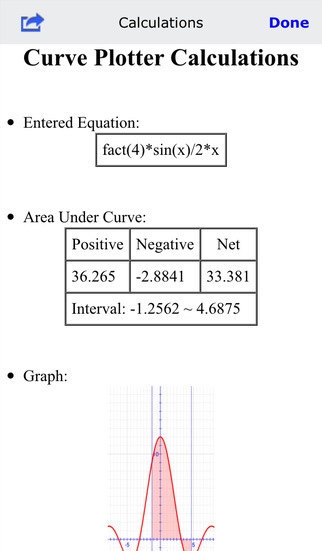 A summary sheet can also be generated which displays a wide range of information such as the graph equation, the data points and an image of the graph. This can then be shared on a number of platforms or saved onto your tablet. In terms of basic settings, it is possible to change the gestures, scale and colour scheme within the app. When first opening the app a handy illustration appears to guide you through the function of each icon on the screen. This is the only support for operating the app and really it is too limited for the average user. For all that the app offers much of what it does can only be discovered by trial and error. Hopefully a further update will provide a more comprehensive set of instructions to make it easier to access all the functions. There are few educational apps that focus so closely on only constructing graphs so it is difficult to compare at this stage, however the package is reasonable for the price paid. 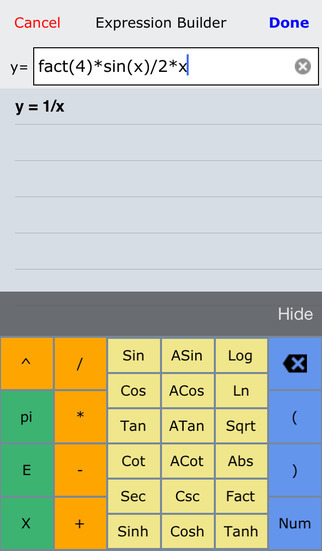 Mathematicians will see the great benefit of how simple these apps present data and solve calculations. Scientists will enjoy the ease of entering measurements and instantly seeing trends between variables. Curve Plotter, is one of the best graph applications available in the App Store, yet easy to use. It is a handy tool essential for doctors, engineers, students and laboratories. Used to plot the mathematical equations, it uses advanced expression interpreter to plot those equation’s curves. Just enter your expression and the app automatically will do the rest for you, and represents the graphical output instantly on a Cartesian plane. You can always manipulate the graph interactively (zooming in/out, scrolling and tracking). so you can determine the value of (y) for any given value of (x), plus the slope of the curve at that specific point. also you can get the precise numbers using a dedicated Solver UI. you always can get the equation and numerical results in a formatted sheet that can be exported or shared. It also shows & calculates Area under the Curve between any arbitrary two points. - Easy expression entry form. 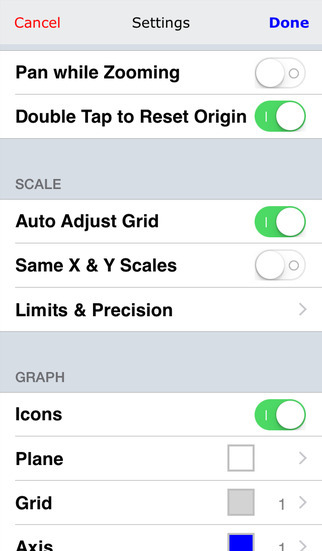 - Settings for controlling the graph look & behavior. - Controlling pen properties & Text properties like colors, thickness and size. - Zoom in/out, scrolling & Tracking. - Saved Expression & expression history. - Solver UI for Precise Values. 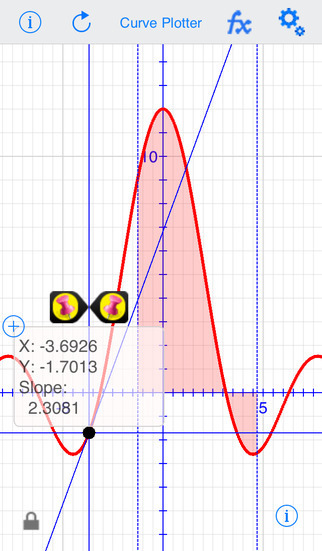 - Live Curve Slope Calculation. - Calculates Area under Curve, between any two points that can be tagged interactively.